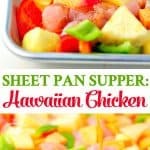 This Hawaiian Chicken is an easy and healthy dinner that bakes entirely on one tray! 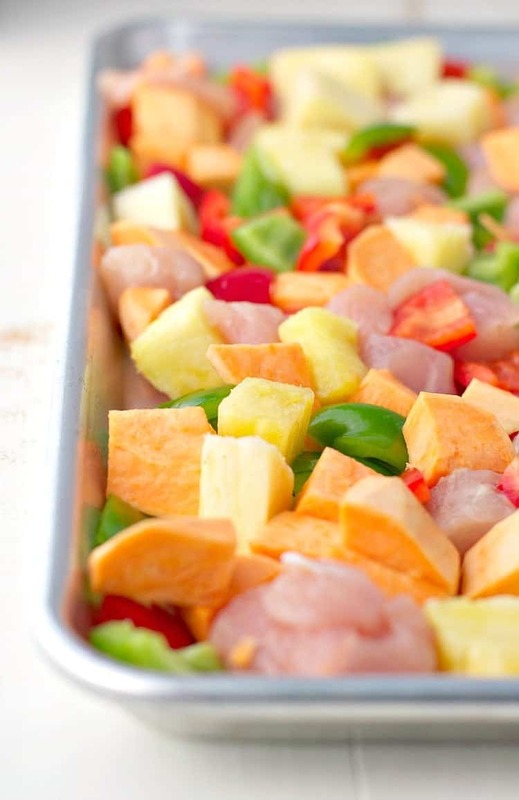 This Hawaiian Chicken with Sweet Potatoes, Peppers, and Pineapple is an easy dinner that cooks entirely on one tray! It’s a healthy Sheet Pan Supper that the whole family will love — with only a few dishes to wash at the end! With cooler fall weather on the horizon and an air conditioning system that has been repaired, I’m slowly turning on my oven more and more to make dinners that I can actually BAKE, rather than the salads and grilled meats that we have lived on for the past 3 months. Isn’t it amazing how a change of season can completely alter our cooking? It’s a breath of fresh air…in more ways than one! A Sheet Pan Supper is one of my favorite ways to make mealtimes easy. And now that we’re all getting back into the school routine (ahem…another drastic change with the seasons! ), EASY meals are KEY! With these one-tray dinners, I can cook an entire meal on…you guessed it…ONE TRAY. That means that everything is done at the same time and I have very few dishes to wash when the meal is over. WINS all around! 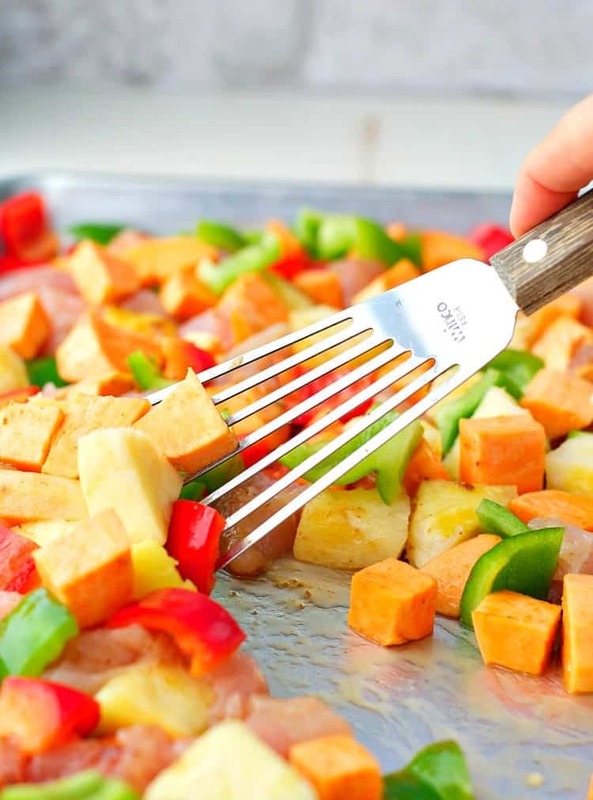 One tip is to make sure that you cut the meat and the potatoes into bite-sized pieces that will cook in a short amount of time. And if you don’t want to wrestle with cutting up a whole pineapple, just buy the pre-cut container of fresh pineapple in the produce section. Works like a charm! 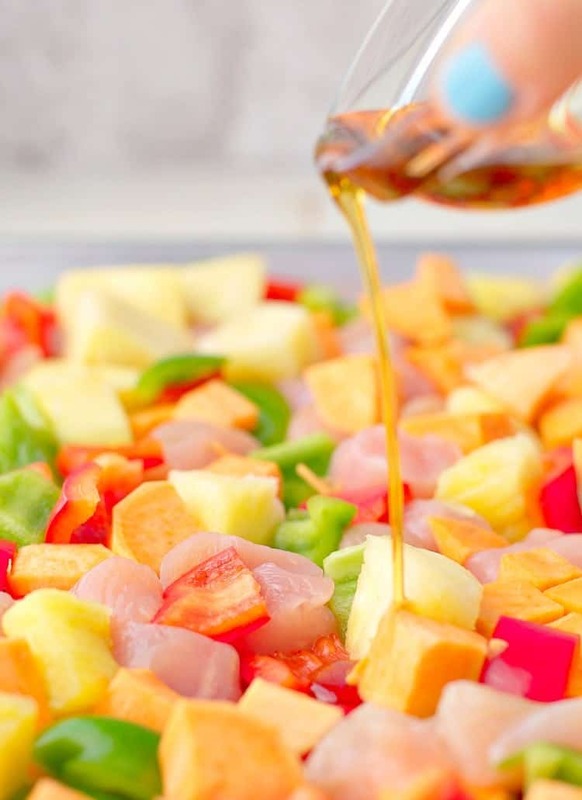 Once all of your ingredients are chopped and spread onto the rimmed sheet pan, just drizzle with oil (DO NOT skip the sesame oil…that stuff is SO good and gives the dish so much rich flavor. If you omit it, your dinner will be bo-ring)!? Sprinkle with brown sugar or coconut palm sugar, and season with salt and pepper. Give it all a good toss to make sure that everything is coated (hands work well for this too! ), and then spread it all out in a single layer again. 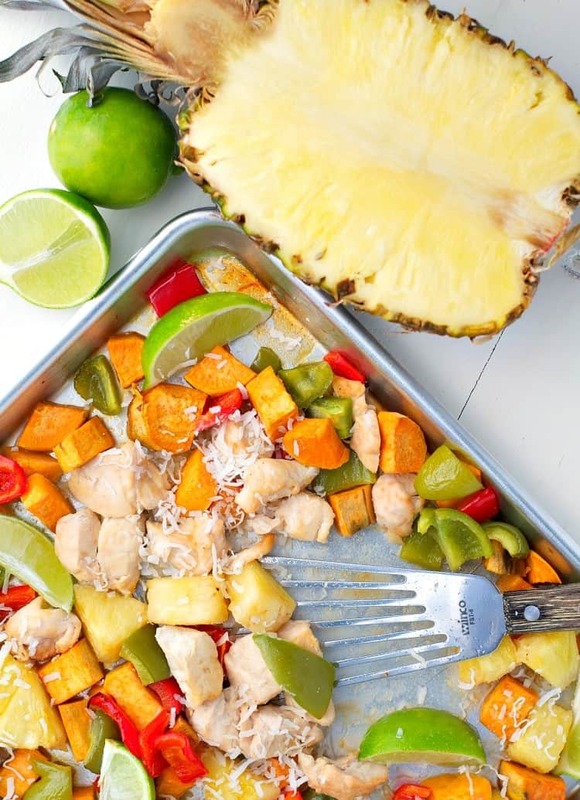 After about 25 minutes in the oven, you will have super-sweet and juicy pineapple, soft sweet potatoes, and tender chunks of chicken and peppers. It’s a sweet-and-savory Hawaiian Chicken combo that kids love too! Garnish with a squeeze of fresh lime juice and some shredded coconut for a truly tropical vibe! Now I would tell you to serve this over rice (with some of the pan sauce poured on top), but my family actually loves it stuffed inside tortillas (or lettuce wraps) as Hawaiian Chicken Tacos. Hey, do whatever works for YOU. Keep dinnertime easy with a one dish recipe that everyone can enjoy! If you’ve tried this Hawaiian Chicken or any other recipe on The Seasoned Mom, then don’t forget to rate the recipe and leave me a comment below! You can follow me on Facebook, on Instagram, on Pinterest, and on Twitter! 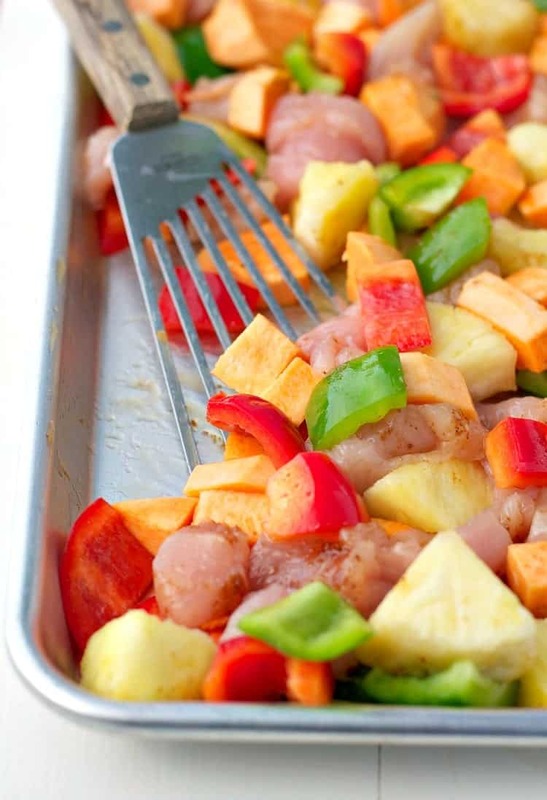 Place chicken, pineapple, peppers, and potatoes onto prepared baking sheet. Drizzle with sesame oil and canola oil; sprinkle with sugar and season with salt and pepper. Toss to coat all ingredients. Roast in oven for 15 minutes; stir, and return to oven to an additional 10 minutes or until lightly browned and chicken is cooked through. Sprinkle with coconut and drizzle with lime juice just before serving. Cooking Just for Two? Cut the ingredients in half! The baking instructions remain the same. I just made my first sheet pan dinner a few weeks ago and am hooked! 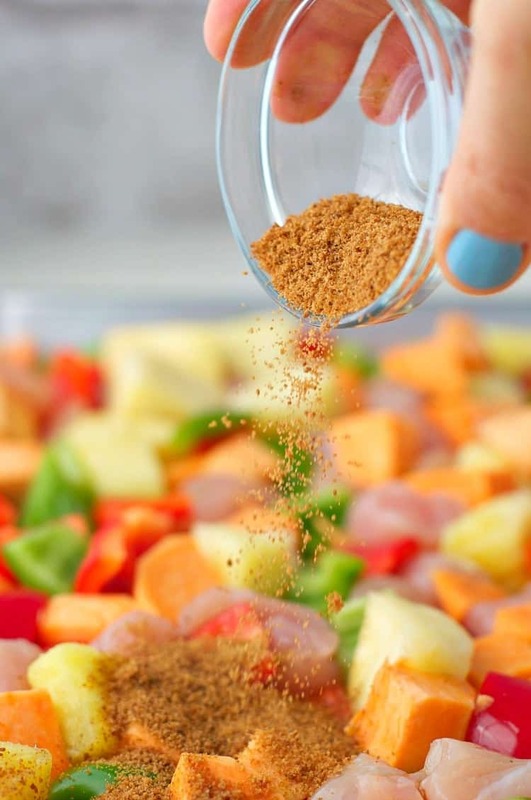 I’ve got to try this Hawaiian version…love the flavors and how easy it is! Gorgeous pictures, too! I love me a simple sheet pan supper – also CUTE NAILS! This is such a delicious combination! Sheet pan dinners are one of my favourites when I’ve had a super busy day and still have things to do before dinner as I can just pop it in the oven and do what I’ve got to do while it cooks! This looks delicious! 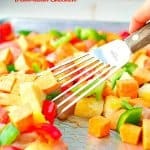 I’m planning on making this for dinner tonight but am wondering if it would work in the slow cooker? It’s hot today and I’d rather not heat up the kitchen. Thanks!! Hey, Cheryl! That’s a great idea! I think it would definitely work in the slow cooker. I would try about 3-4 hours on low. You don’t want to cook chicken breast too long or they’ll dry out. Let me know how it works! This looks really yummy! Would it work as a freezer meal? Hi, Amy! I have never tried it, but yes — I think it would probably work well as a freezer meal! Would this work with canned pineapple chunks? Hi, Sara! Yes, the canned pineapple chunks should be fine!